I was looking for a half-day trip from Zurich by train; something to fill the time before I needed to head to the airport to catch my flight back to Dublin. 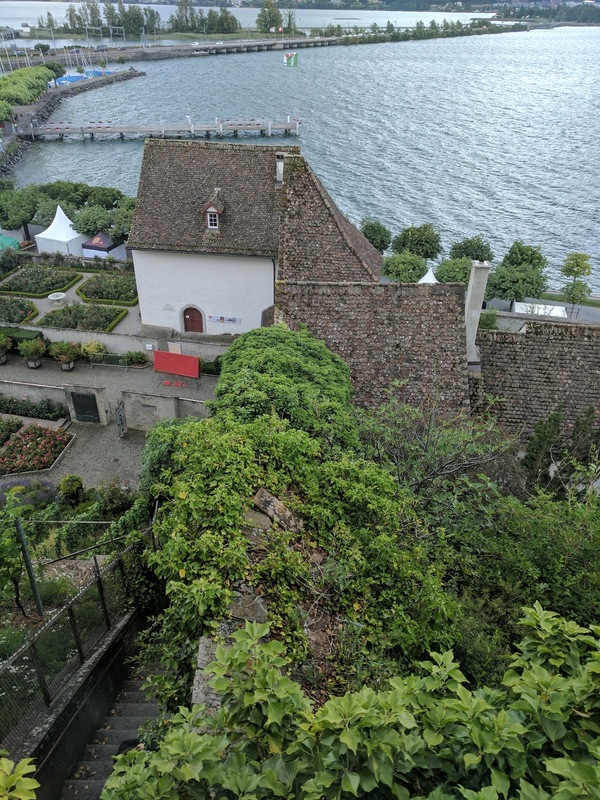 As a frequent visitor to Switzerland, I've done several day trips from Zurich by train including a day trip from Zurich to Liechtenstein and a cruise around Lake Zurich. 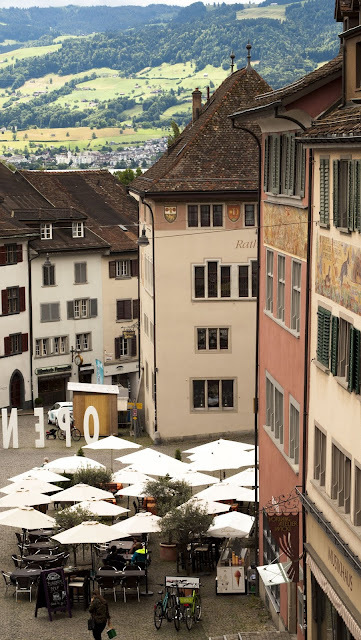 Exploring virtually on Google Maps, I noticed Rapperswil and was immediately intrigued when I read reviews promising "a beautiful city" and "you can see many birds". Rapperswil seemed like the ideal summer day trip from Zurich (I visited in June 2017). 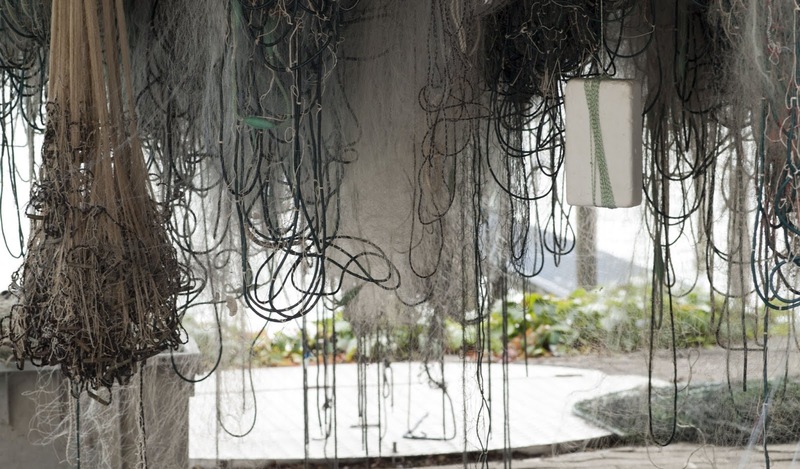 What kinds of things are there to do in Rapperswil? Read on to find out more about my brief visit. 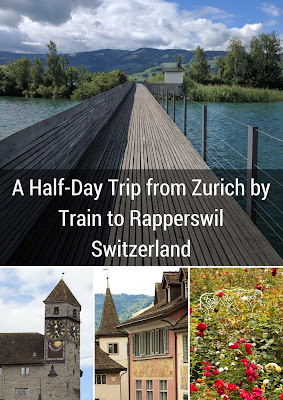 I was sold on Rapperswil as a day trip destination from Zurich based on what I'd read so I booked an all-zone ZVV day pass on the SBB Mobile App. Since I was booking last minute and needed to go to the airport later, the ZVV day pass (priced at 34.40 CHF at the time of writing) was better value than individual tickets. The ZVV transit pass also ensured that I could get around on the trams and buses once I arrived back in Zurich to pick up my luggage and make my way to the airport. 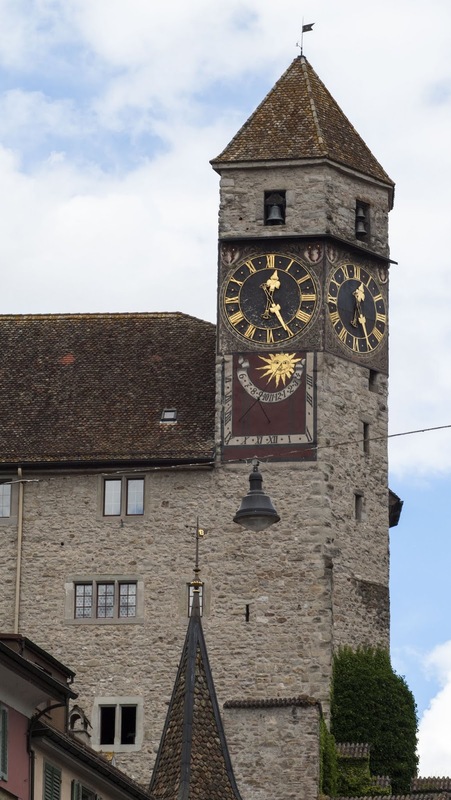 How long does it take to get to Rapperswil from Zurich City Center? The ride from Zurich Stadelhofen station to Rapperswil station takes between 30 - 40 minutes on the S-Bahn. 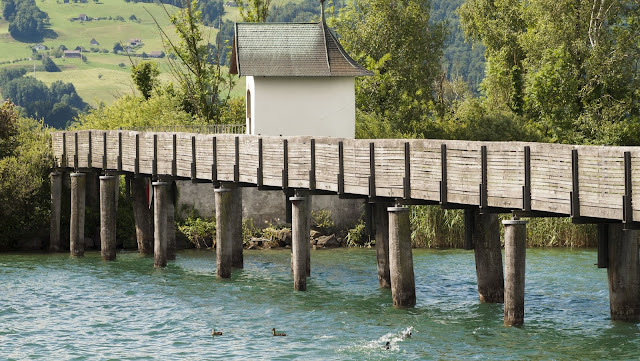 When I arrived in Rapperswil from Zurich, I immediately made my way to the wooden boardwalk spanning Lake Zurich at its narrowest point. I was excited to see where the path would lead and what natural wonders were in store. From the wooden boardwalk, I could see mist gently touching the tops of the nearby mountains. 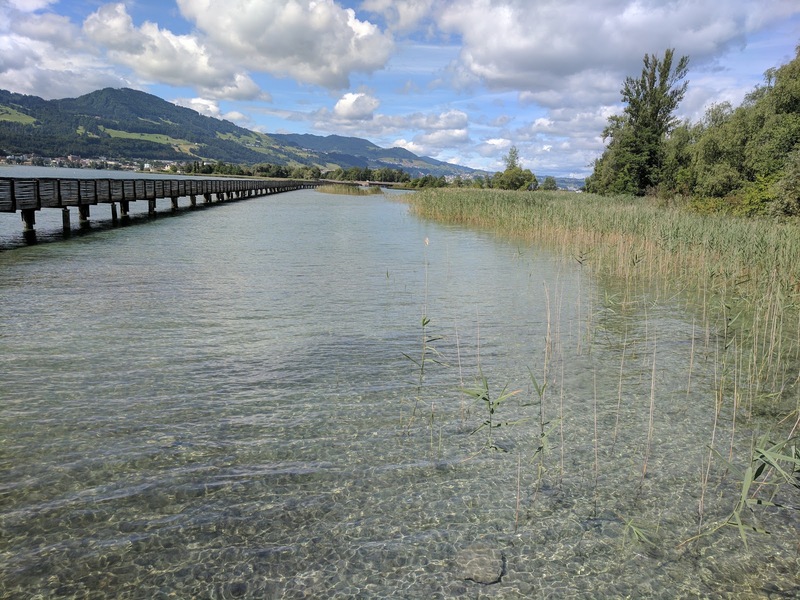 The scenery near Rapperswil is incredibly picturesque. 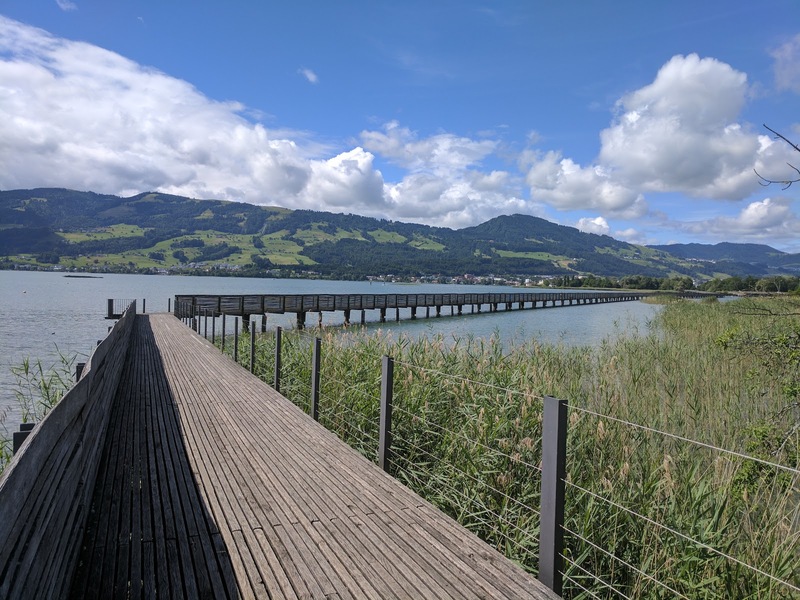 I sat for a mindful moment on one of the benches on the wooden boardwalk near Rapperswil and admired the sailboats gliding across Lake Zurich in the shadow of the mountains. The space between Seedamm (a partially artificial causeway and bridge) across Lake Zurich at Rapperswil and the wooden boardwalk was a popular haven for birds. I spotted countless ducks, grebes, and swans swimming in the crystal clear water. I hadn't intended to walk all the way across the wooden boardwalk but I simply couldn't resist seeing where it would lead. Google Maps suggested that Hurden lie just ahead. 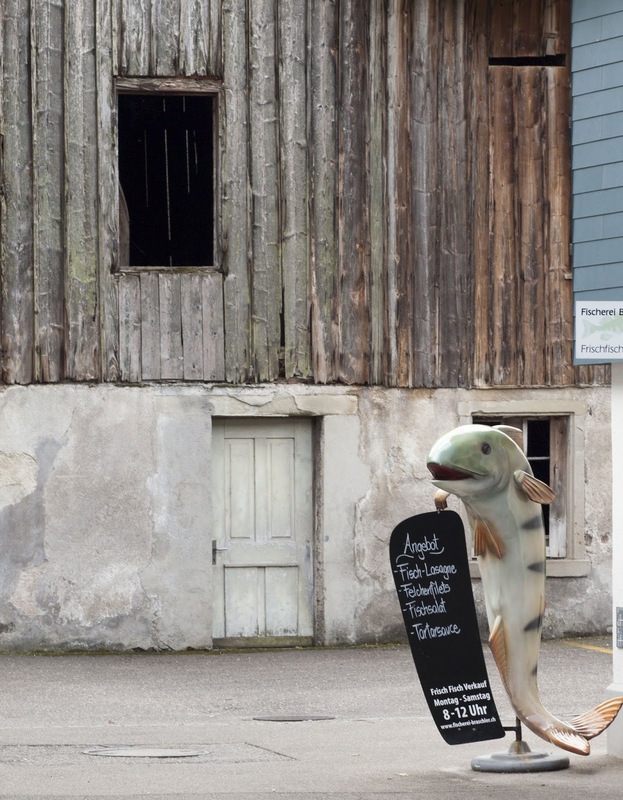 I arrived in Hurden between 10 and 11 am and this quaint Swiss fishing village seemed like it was still asleep on a Saturday morning. Fishing nets hanging to dry suggested that I should bookmark Hurden as a place to check out for seafood if I ever visited again for lunch or dinner. 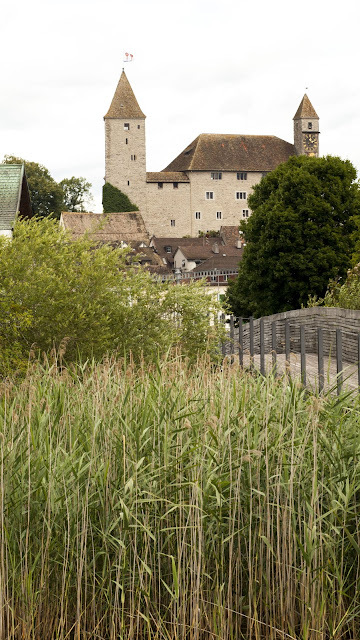 Retracing my steps across the wooden boardwalk, I could see Rapperswil Castle in the distance and set a course for the village. 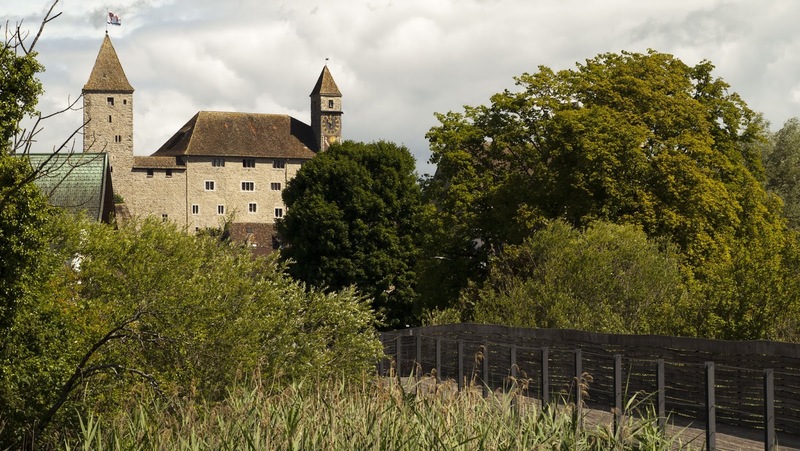 Exploring the grounds of the castle is one of the most popular things to do in Rapperswil. 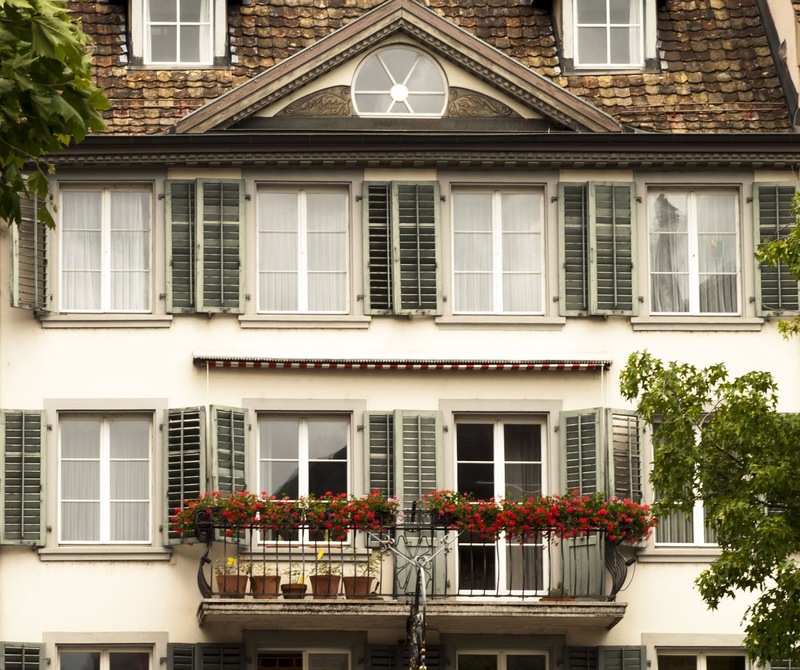 I really enjoyed walking among the buildings with matching colored shutters and flower boxes on the balconies. I soon found myself at the base of a hill with the castle looming above me. Climbing the steps upward, I took a moment to look down upon the square below. 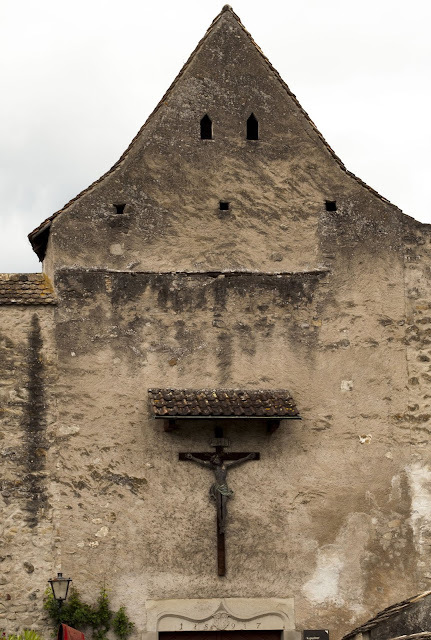 Returning to the square below, I walked along the path at the edge of Rapperswil Castle, I soon came upon a weathered stone building bearing a crucifix. I'd arrived at the Capuchin Friary. Dating back to the 17th century, it's possible to wander mindfully around the grounds at no charge. 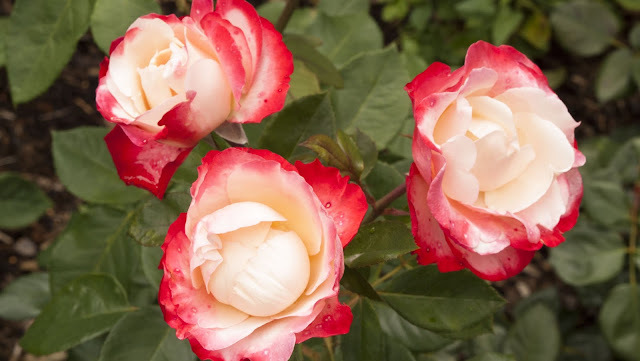 Just outside the friary lies another of the most popular things to do in Rapperswil: stop and smell the flowers at the Rapperswil Rose Garden. 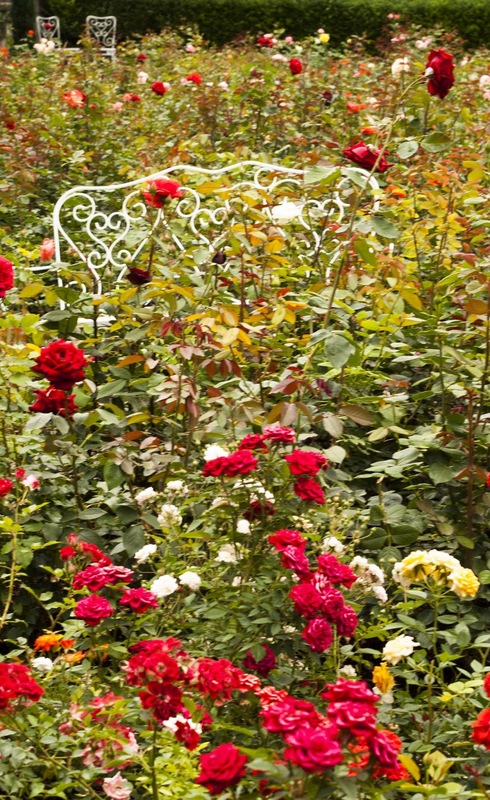 The Rosengarten der Stadt Rapperswil is a riot of color with wrought iron benches dotting the landscape. 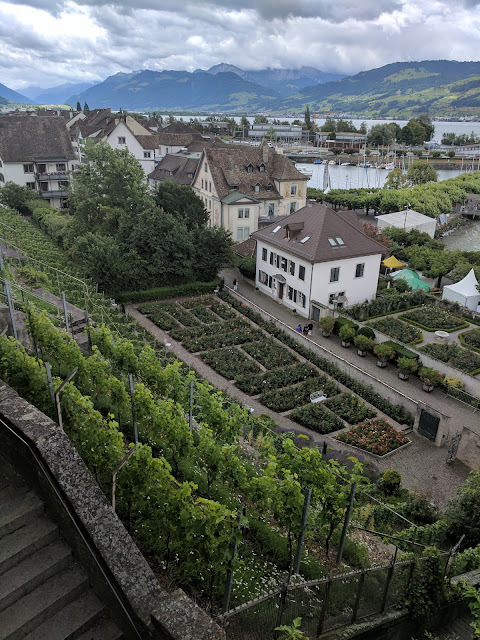 Just above the Rapperswil Rose Garden, vineyards cling to the hillside. 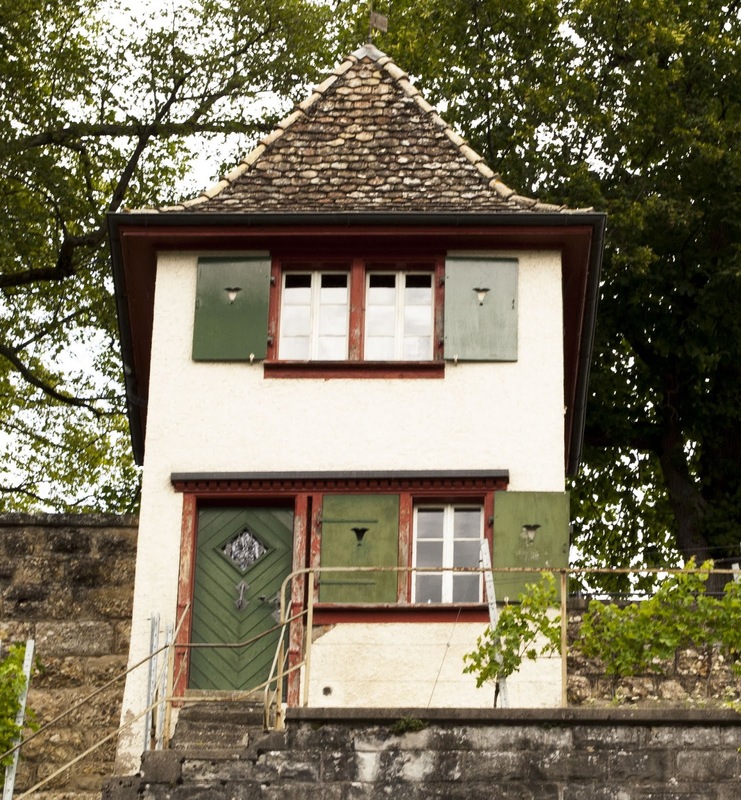 The stairs up through the vineyards deposit you in a park behind the Rapperswil Castle. Come full circle and back to the main square for a bite of lunch. Rapperswil Castle and the surrounding area offers great people-watching because many weddings are held here. 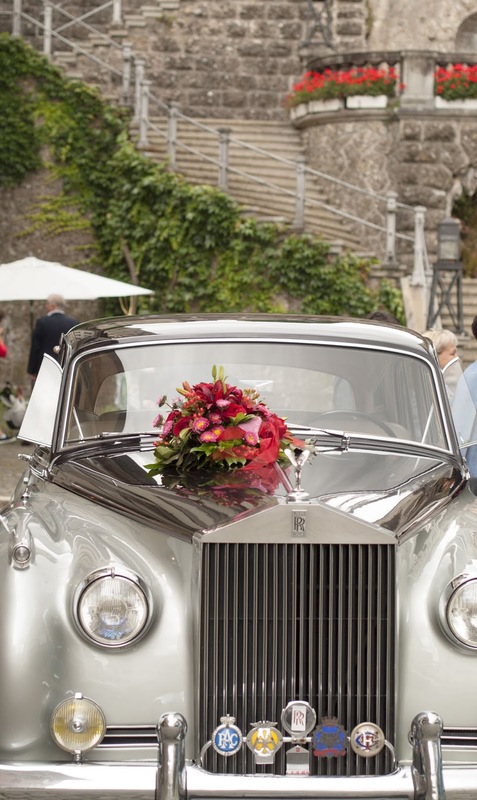 An old-fashioned Rolls Royce was parked below the castle on the day I was there presumably to whisk away the newlyweds to start their honeymoon. As you can see, there are quite a few things to do in Rapperswil making the town a nice summer day trip from Zurich by train. Have you visited Rapperswil? 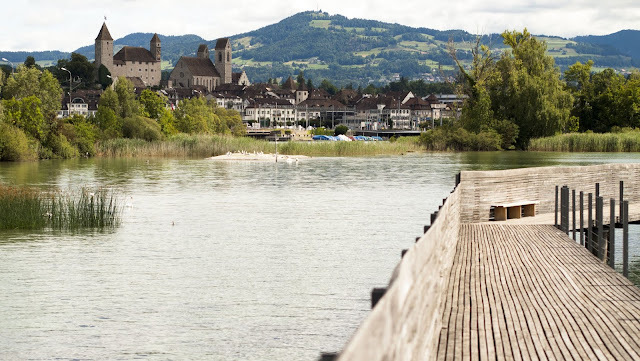 How would you rate Rapperswil on the list of the best days trips from Zurich? 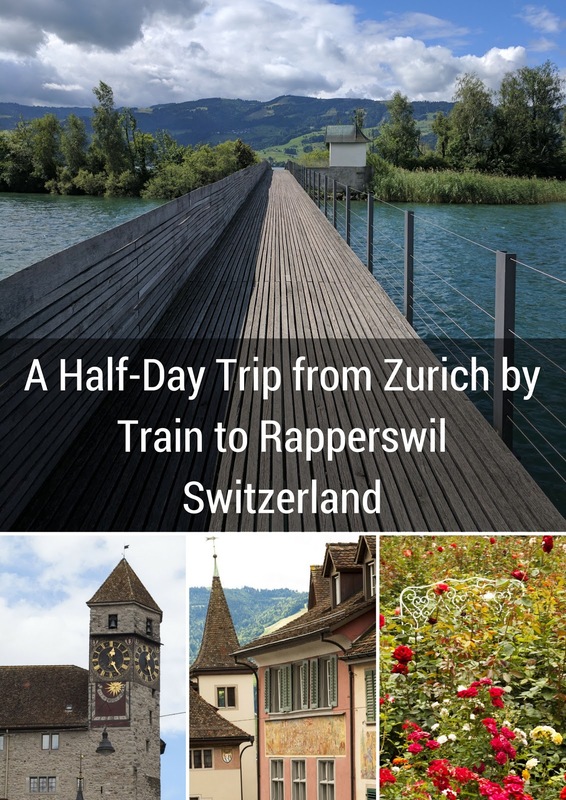 Read about a half-day trip from Zurich by train and explore the village of Rapperswil Switzerland by public transportation. 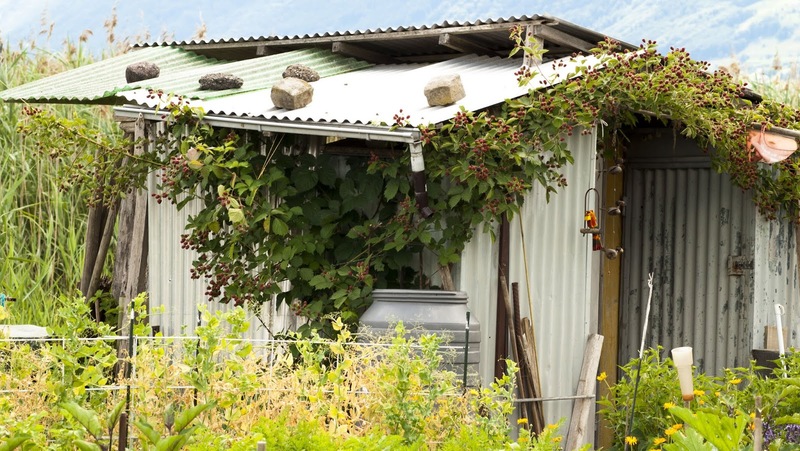 A photo-rich post by travel blogger, Jennifer (aka Dr. J) from Sidewalk Safari.